After such a fun visit to the Marchesi de Frescobaldi camp at Vinitaly, I was really looking forward to seeing two of their estates on my trip through Tuscany. Agnese, assistant to Tiziana Frescobaldi, the director of Communications, had suggested that we visit Castello Nipozzano and Pomino Estate which are just East of Florence along the Arno and Sieve rivers. After a major blunder on my part in navigation, I arrived later than expected, but to a friendly and inviting welcome from Agnese and Gianluca who immediately drove us from Nipozzano, to Pomino Estate, just 10 minutes away. In those few minutes, we went from a typical Tuscan countryside of manicured rolling hills with vines and olive trees to what I would consider another kind of paradise: pine and cyprus-covered hills, more like mountains, a view of the valley below and a fresh cool breeze. The sights, sounds and scents of Pomino brought back many happy memories of places like Carmel Valley, and Yosemite. 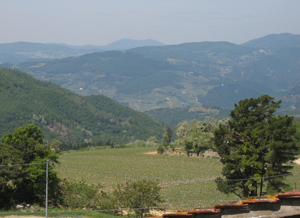 The vineyards here are small, and fit in like puzzle pieces with the groves of chestnut and pine trees on the hillsides. At elevations ranging between 1,000 and 2,300 feet, and with cooler evening temperatures, Chardonnay, Pinot Grigio and other white varietals do well here, not to mention the Pinot Noir, which is expressed exceptionally well in Pomino’s Casafonte vineyard. Since the 19th century, Pomino has also been producing Vin Santo, a delicious and wonderfully Tuscan after-dinner favorite not to be overlooked or more importantly not to be simply grouped with sweet dessert wine. Made from Chardonnay, Trebbiano and a little bit of Sangiovese, Vin Santo is usually enjoyed with small biscotti after dinner, but can also be enjoyed as an aperitif with foie gras, which I am excited to try. We were upstairs in the Vin Santo aging room where the 2005 vintage is still quietly maturing in barrels when I proudly showed Agnese and Gianluca a photo of my friends’ bottles of Frescobaldi Pomino Vin Santo from 1975 and 1971. Every time I go to Lucca, I drop hints that we should see if that vin santo is still good after all these years, but I haven’t gotten a response yet, I wonder why.. When we returned downstairs and outside, I was marveling at how the breeze was making such beautiful music through the pine trees, and had a huge smile on my face. After an unnecessarily tedious drive (note to self, hire a navigator!) I finally felt peaceful and relaxed. 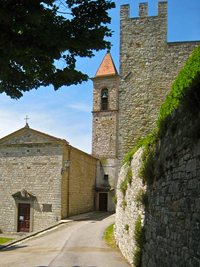 We drove back down the hill to Castello Nipozzano where the tranquility just takes on another form. The Tuscan scenery of hills and olive groves and vines and this perfect old castle-fortress dating back to the 11th century is everything you want Tuscany to be. And it is quiet, beautifully quiet. We started our tour in a room with old equipment used for winemaking and bottling, and I was amazed to see a reproduction of a decree from 1716 describing the different zones of denomination for the region’s wines, like Pomino. The anthropology major in me wondered how anyone could not be enticed to drink these wines with such abundant and tangible history? 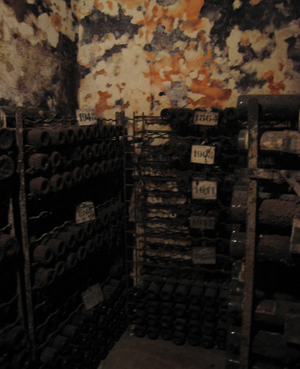 We headed down into the cellars to see both the family’s and the historical collections. I learned that when there is a new addition to the Frescobaldi family, a number of bottles of Nipozzano Chianti (in the hundreds) are set aside for them as a birthday present and a simple wooden plaque is hung with their name and birth date stenciled on it. Stacks of dusty, unlabeled bottles lined the walls and then I saw the most recent stash of perfectly clean bottles that had just been placed there in October. 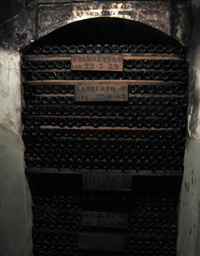 The Frescobaldi name is still flourishing, and in contrast, another cellar behind iron gates with beautifully colored walls holds the family’s historical collection, many bottles of which are survivors of a German attack in 1944. Stacks of bottles with the same wooden signs show the years 1864, 1908, 1911 and on up, the number of bottles increasing with the years. When I comment on the colorful walls inside, I am told that the colors change with the seasons, due to the fact that what covers the walls is not paint, but cellar mold! Who knew mold could be so quaint and charming? Gianluca left us to meet another group, and Agnese and I walked into the residence to go through some of the rooms. Not simply a museum or showroom of Frescobaldi history, this is where the family entertains and enjoys the fruits of their labor. There are photos of Britain’s royal family, American movie stars and more enjoying the grounds and the wine. The home is relaxed and elegant, well-appointed and comfortable at the same time. A new addition to the facility is a multimedia presentation room with an adjoining kitchen and prep area for conferences and presentations. As we reached the small courtyard off of one of the living rooms, I noticed a table beautifully set for two out in the fresh air. 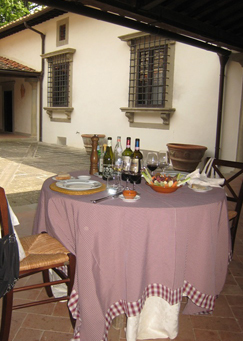 It was lunchtime and this was our table, dining al fresco at Castello Nipozzano! The first plate was an assortment of Salumi which we enjoyed with the Pomino Bianco, the perfect glass of wine for this sunny, warm day. Next came the “chitarra” spaghetti accompanied by the Nipozzano Chianti which we enjoyed over our conversation about Los Angeles and California, and other places Agnese has visited in the States. This is how Italian lunch should be: equal amounts of great wine, delicious food and fun conversation. We had the bases covered with an extra helping of beautiful weather. The next course was thick slices of perfectly cooked beef tenderloin and the Castelgiocondo Brunello. It was nice to experience Brunello like this, mid-day, outside with lunch. Something I have never done, and something I had never even considered. With newly opened eyes, the boundaries of wine had just expanded for me. After dessert and coffee, we walked through the house to the kitchen to thank Chef Leah. As if I needed more reason to be impressed by this place, I saw hanging on the wall with other menus and letters, a photo of Charles and Camilla and a letter thanking the Frescobaldi family for their wedding gift of selections from their cellar. It was hard to remember that this was a working day in such a serene setting, but it was time to head back west to Lucca for the night. I wasn’t the only visitor at Nipozzano that day, and there would be plenty more journalists and enthusiasts coming in the following days to learn about the history and winemaking of the Frescobaldi family. 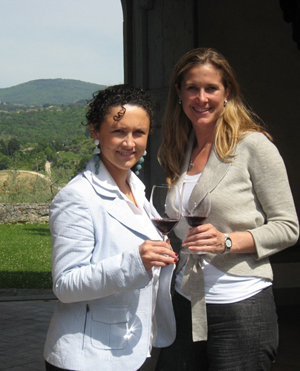 I personally look forward to exploring their Castelgiocondo Estate in Montalcino the next time I am in Tuscany. 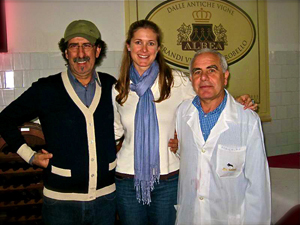 The next time you are in the mood for a Tuscan experience, forget the “chick flicks” and head to your local wine shop. 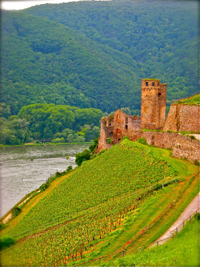 You can experience all the romance and beauty of this region on your own terms by enjoying a bottle from Frescobaldi. For you Californians and Californians-at-heart out there, I suggest a Castelgiocondo Brunello di Montalcino paired with a generous slice of Humboldt Fog cheese. Enjoy! 2008 Domaine de Fontsainte Rose, Corbieres, Gris de Gris, France. Early Friday morning, my friends and I drove to the nearby sports and recreation area owned by the US Navy to meet a tour bus that would take us for a weekend wine tasting in Puglia. I learned to play golf many years ago at this recreation area known as Carney Park, and always loved it because it is literally on the floor of an ancient volcano crater. From the park you look up in any direction and see the tree and grapevine-covered walls of the crater rising up to the sky. Once on the bus, and on the road to pick up more passengers, I sighed a huge sigh of relief at the notion that I did not have to DRIVE! We were in a luxurious tour bus and Vito, our competent driver whom I remember from many years ago, was at the wheel. We picked up our guide, Barbara and the other passengers and were on our way down the beautiful A16 highway heading east and around the back side of Mt. Vesuvius. Speaking of this route, I keep hearing about the restaurant in San Francisco, “A16” and its fabulous Campania dishes and wine selection, and have put that on my list of things to do when I return. After about four hours of head-bobbing sleep on the bus, we arrived in Locorotondo, a whitewashed hilltop town formed of concentric circles, each reflecting a later time period of building and progress, surrounding its ancient 12th century center. 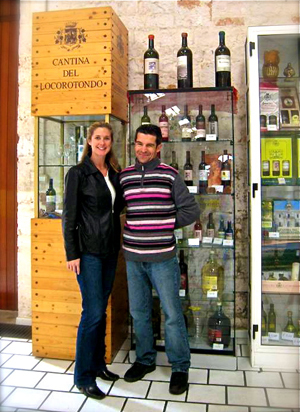 We headed to Cantina del Locorotondo, a “cantina sociale,” or co-op winery founded in 1930 by a group of grape growers. (www.locorotondodoc.com) Our guide, Mastro Oronzo told us that today, the coop has over 700 members and in 1969 was given the DOC denomination of “Locorotondo.” After touring this massive winery, with huge underground facilities for the fermentation tanks, we sat down in a nicely presented tasting area and were immediately offered plate after plate of tasty, simple appetizers. Mastro started pouring and describing the wines and the first one, fruity and a bit frizzante was a hit with many in the group. The second white was the 2007 Talinajo, from Verdeca, Bianco d’Alessano and Fiano grapes, which I liked for its complexity and a nice balance of acid and fruit-herb flavor. I was given a bottle of the 2008 to bring home with me and thoroughly enjoyed it one evening with my friend when she made pasta with cooked spinach and cherry tomatos. Nibbling on Pugliese “panzerotti”, or mini fried pizza turnovers, we moved on to the reds, like Nero di Troia, a grape I had never tasted, and the overwhelming favorite, the Terre di Don Peppe primitivo, which is a grape akin to our Zinfandel. After the tasting, the group lined up to purchase bottles of their favorites, and some even purchasing the bulbous 5litre glass bottles in baskets as souveniers. 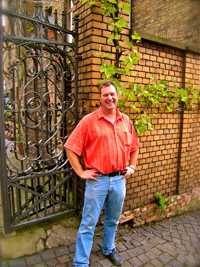 Like most wineries, they do not bottle every ounce of wine they make. Locals come into the winery with their large glass bottles and “fill up” at the tanks just inside. This is the charm of winemaking and local consumption, and after spending so much time in wine shops looking at all the stunning bottles and labels, there was something also beautiful in the simplicity of this, seeing wine as an integrative and obvious part of every day life. We left the winery glad that the bus had cavernous storage underneath for all the cases of wine, and headed to our hotel in the seaside town of Monopoli. Yes, there really is a Monopoli, but move over park place, all of their properties are beachfront! While my friends went to stick their feet in the Adriatic for the first time, I rested before our tour of the town. Our local guide, Caroline, led us through the narrow and curvy streets past some very different churches, including one with encased mummies that you could see through the windows. We were welcomed into a neighborhood restaurant which was able to accommodate our large group easily. Plate after plate arrived and we shared the different tastes with the house wine until late into the night. Though I am not a stranger to the three-hour dinner, there is always something amazing about sitting down to eat and realizing how much time has gone by…and how many dishes you’ve eaten! Well, when you’re in good mixed company and the food and wine just keeps coming, it is pretty hard to jump off that train. The next day we headed just south to Alberobello and the Cantina Albea (www.albeavini.com) which surprised us with an excellent wine museum on property with beautiful photos and explanations in Italian and English. A great way to learn about the grapes and wines and culture of Puglia, our guide walked us through the various exhibits in the two-room museum. We were then treated to a short film about the region of Puglia and its treasures before sitting down at their long tables which had been nicely prepared for our tasting. Plates of traditional cheeses were passed as the first wines were being poured. The first wine was their Il Selva DOC Locorotondo Bianco with its characteristic golden straw color and tropical fruit aromas. This wine paired nicely with the “caccio cavallo” cheese they had passed around, with its firm texture and mild flavor. The first red was the 2006 IGT Raro Negroamaro and Primitivo blend, with toffee and licorice aromas that gave way to dried cherry flavors. Gentle tannins made this a nice accompaniment to the selection of salami that were offered. The 2006 IGT Petranera 100% Primitivo had fresh aromas and taste instead of the more cooked or jammy flavors, which I really liked. This wine was like chewing a mouthful of ripe black cherries, with the flavors lingering at the finish. I was particularly interested to read in their brochures that the winemaker of their array of award-winning wines is Riccardo Cotarella, the famous Umbrian enologo, interestingly enough, also the winemaker at Morgante winery in Sicily. Several of us at the table had opted for the additional tasting of their 2005 IGT “Lui” made from Nero di Troia grapes, and this Gambero Rosso 3-glass-winning wine did not disappoint. This enjoyable wine left you having to remind yourself that this was a tasting, not a drinking. This wine is nearly black, not red, with soft aromas of licorice and cherry. It is soft and full in the mouth, with layered flavors of bitter cherry and spice, perfect for roasted meats and aged cheeses like the manteca affumicata that we were served. During the tasting my friends were really trying to learn how to pick out the fruity aromas and flavors of the wines and my friend Kirsten was particularly inspired by one of the comments that was offered to us, “red wines, red fruits and white wines, white fruits.” Our charismatic tour organizer, Natalie, when trying to confidently express what she was tasting had innocently asked one of our hosts if one can really be wrong with what one smells, and he instantly answered, “yes!” Well, ok, at least we all agreed that the wine was excellent! 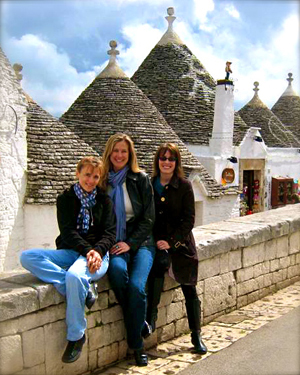 After wiping out the supply of Lui available in the cantina, and thanking our excellent hosts at Albea, we set out for the charming town of Alberobello to see the ancient trulli houses before heading home. 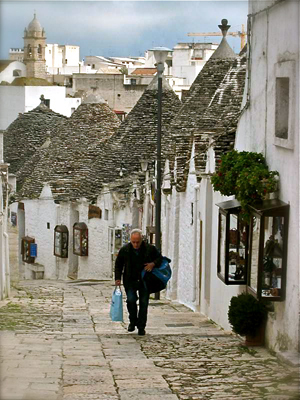 Alberobello is an amazing hilltop town surrounded by olive and almond trees, and because of the amazing conical-shaped trulli houses, it has been declared an International Human Resource by UNESCO. Trulli are common in the central part of Puglia, and nowhere else, and their history dates back to the middle ages by some accounts: Because of the structure of taxation on the king’s land, anyone with a permanent home would pay heavily. Therefore, the people of this area devised a structure based solely on stones readily found in the area, and utilizing a centerstone that would keep the structure intact. Upon hearing word that the taxman was coming, the contents were removed and that centerstone would be removed, causing the entire structure to crumble into an unrecognizable heap. When the danger had passed, the homes could be re-assembled. Hex symbols identify individual Trulli, which, with their whitewashed walls and grey conical stone roofs would normally be difficult to distinguish. 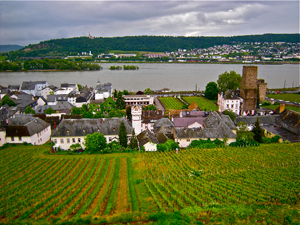 These symbols only add to the magical charm of this town, which is nothing short of a fairytale village. Like the new tastes discovered in the wines, the flavor twists in their regional dishes and the amazing history of this region, Puglia proved to be a world apart, while only hours away.